Leave a comment between now and midnight Monday, March 29 on the Found Art blog tour post. Click here. After reading Leeana's book themed on dramatic growth in her life in a one-year period living in a foreign country as a newlywed married to a Navy SEAL, I thought about what my own found art might be. What would the objects I chose represent? The ever-present writer's cup of coffee, now cold. This represents something that brings me pleasure and comfort while I'm typing away. God gives us so many small joys that we often take for granted. Bath and Body Works Aromatherapy Orange Ginger body lotion--one of the best fragrances ever, stocked by this hotel. The sweet pungent aroma of being alive and especially, alive to God and alive for others. 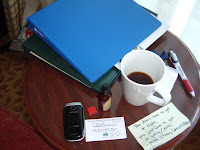 A note with the passcode to the wireless internet here and a reminder to pick up waters for the convention speaker. A quote I had post-it-noted to my laptop. This tells me how intrinsic writing is to my life--I must have pen and paper at all times, for lists, thoughts, quotes, ideas. The quote itself: You don't have to get it right, you just have to get it going/done--Mike Litman. I'm a procrastinator and an inconsistent perfectionist. I added the "done" part to this man's thought, knowing how much I need this push to get started and finished with the projects God drops like friendly, messy packages in my path. A card for a free Starbucks beverage, given to me by the friendly maintenance man who promptly replaced a burnt-out bulb on our hotel room desk. Life is full of surprises, and when they're good ones, I need to rejoice and give thanks. Like when I learned today that my dad's CT showed no cancer, which means he probably has a cure. A pen. I've already covered this, concerning writing, above. The notebook with all my computer passwords. The cap to my flashdrive, which is usually attached to my laptop. These are my lifelines, which go everywhere the computer goes (which is usually wherever I go). But if there were a fire, there's no question I'd get people and pets out first. I must choose my priorities and not just recite but live them. My cell phone. I smile, knowing if I'd refused to start texting several years ago, I wouldn't be as connected to our young adult children as I am today. And I admit, the Facebook messages and wall posts are kind of fun, too. But I don't even need it to talk to the Father. He's always in the "service area" and safe to message while I'm driving. As Leeana did, I learned about myself while reflecting on these objects of "found art." And like her, I've come a long way and still have a long way to go. And that makes me smile. Imagine getting engaged after you've dated someone seven weeks. Then imagine marrying on his next leave from the Navy and immediately moving to join him in--Bahrain (a country near Iraq and Afghanistan in the Middle East). Thus began Leeana Tankersley's journey into marriage and life in a foreign world of Muslim prayer calls and women clad in abayas. At first she held back from the strange new place, but later she learned to embrace it and allow it to change her, externally and internally. Loosely told in chronological order, Leeana's story unfolds themed by objects that represent significant places, people, and events from her first year of marriage. She tells how she begins to reconcile hurts in her past she thought dead and buried with the joy of being with her husband. From a Navy SEAL trident to a braid of fringe from a Persian rug, Leeana demonstrates the found art in her life and the significance it takes on in who she is now and who she will be in the future. Tankersley's reflections made me pause to consider my own journey. I could empathize with the pain and delight in what life had brought her way. 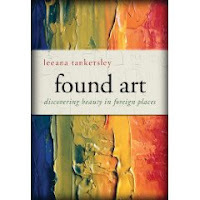 ***Stay tuned for a giveaway of my copy of Found Art, provided by the publisher for reviewing purposes. Take one grandmother, Charlotte, who's raising three lively grandchildren--a high schooler, a middle schooler, and an elementary student. Add a family mystery that's lain hidden in the church basement for generations. Stir in grandson Sam, who wishes grandparents Charlotte and Bob wouldn't pry about his new female friend. Toss in granddaughter Emily, who wonders why she had to be paired with a foreign exchange student for a history project. Salt with younger brother Christopher, who longs to turn the "history mystery" his grandma's discovered into an ace reporter's assignment. These branches of the story converge into a family struggle between unique individuality and harmonic unity. For Charlotte, the quest becomes personal as she seeks to regain honor for her ancestors. Her great-grandfather was accused of theft from the church where she is a member, and his name has never been cleared. How the author blends the ingredients of the story of this family creates the recipe for a great light read true to Christian family values. Comment on this post between now and Friday, March 12, midnight Eastern time. Be sure to leave email address so I can contact the winner.